The chorus to “Angels Among Us” by Alabama says that in our darkest hours, angels “show us how to live” and “teach us how to give”. Many would say that Owen is now one of those angels stepping up to help his alma mater, Jacksonville State University, as the campus and community of Jacksonville recovers from the EF-3 tornado that tore through Jacksonville on March 19. Owen, Alabama frontman and JSU trustee, organized the upcoming Alabama and Friends Benefit Concert as an effort to raise funds to aid the university in rebuilding. The concert, September 26, at Burgess-Snow Field will feature some of the greatest names in country music to hail from our great state. The Charlie Daniels Band, Jason Isbell and the 400 Unit, Jamey Johnson, Shenandoah, John Berry, Gordon Mote, Darren Knight (“Southern Momma”), and Sirius XM’s Storme Warren make up the lineup. Nationwide Insurance, Randy Jones & Associates, Inc., is serving as the presenting sponsor. Platinum sponsors include Dr. Pepper, Alabama Power, Alfa Insurance, Marc and Mary Angel, Ken and Jerry Howell, and Trycon Tufters. 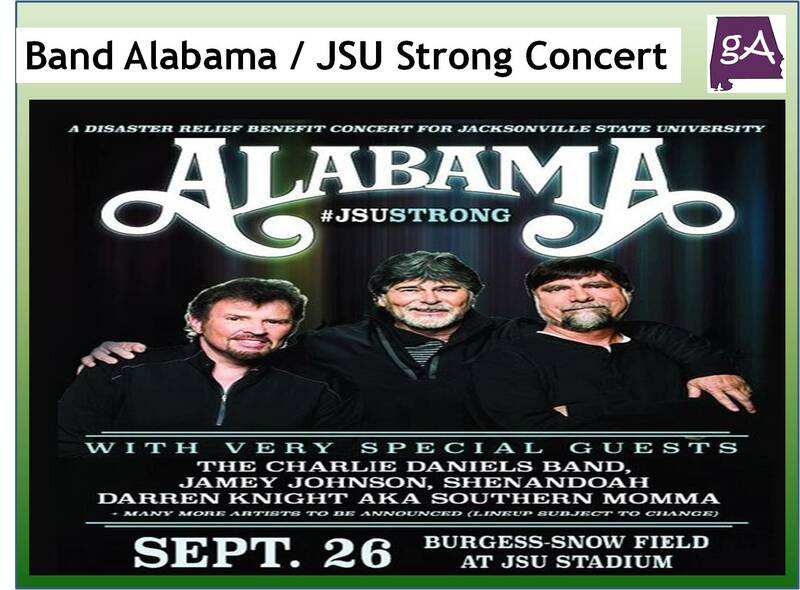 According to JSU’s website, these sponsors will cover the concert expenses allowing 100-percent of the concert’s proceeds to benefit Jacksonville State.